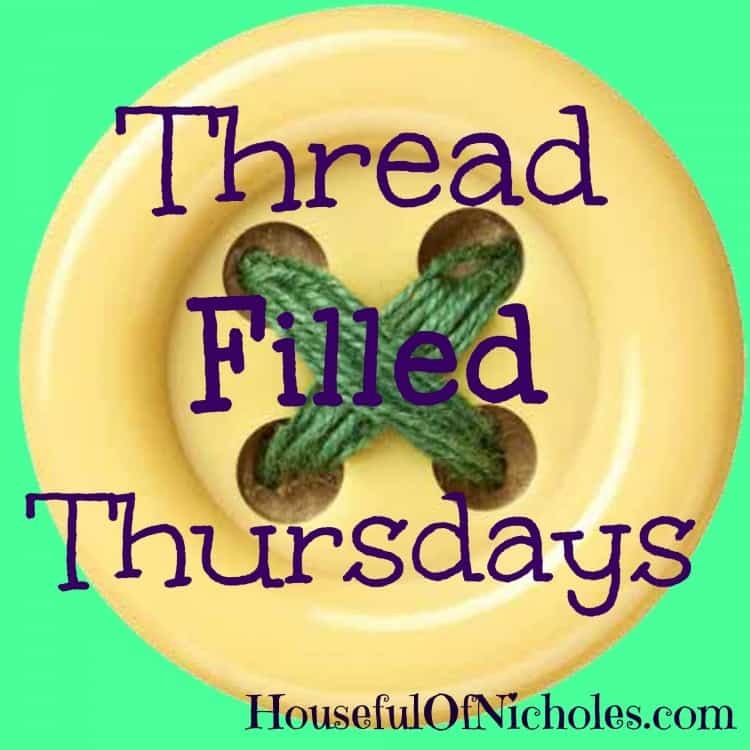 It’s another week, another Thread Filled Thursday, and I’m linking up with something a little different than you are used to seeing here in our Houseful. 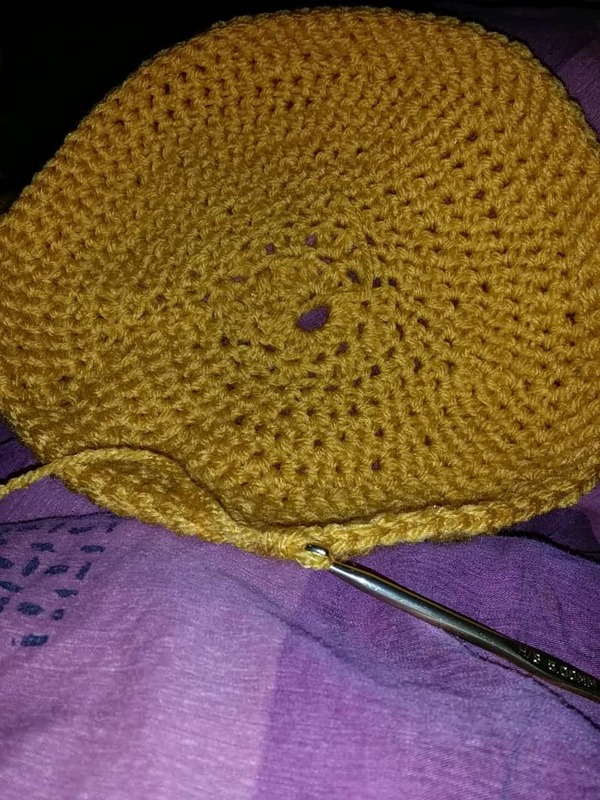 Crocheting! Yes, you read that right. 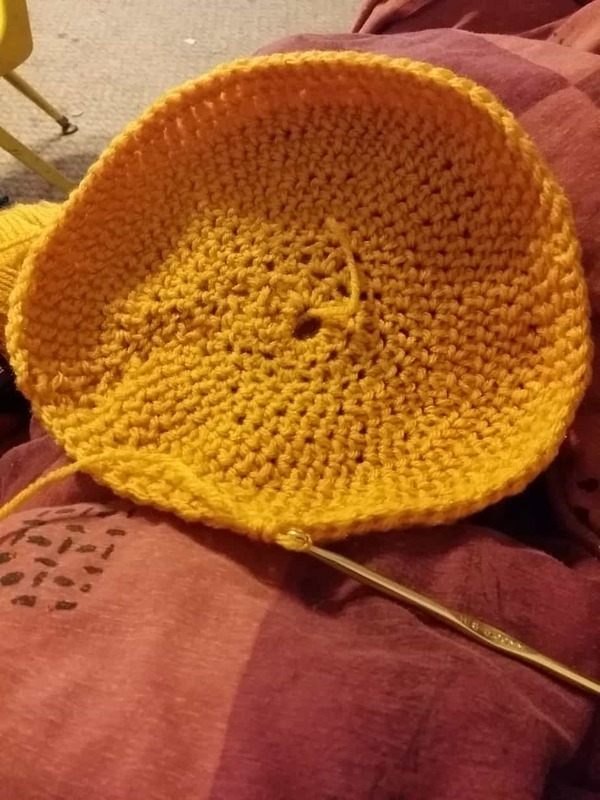 I’ve started crocheting. It started last year when I met up with Maggie from Smashed Peas and Carrots at a Pinterest Party in Michael’s Craft Stores, and it kind of evolved from there. 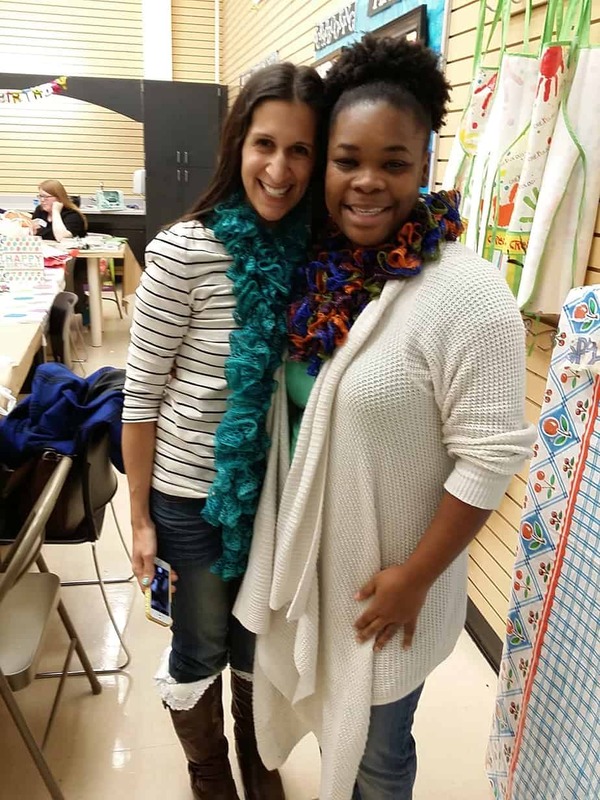 The gateway craft started with a ruffle scarf and then moved on to wanting to make a hat. The ruffle scarf was a lot easier for me to do than I anticipated, and I must thank our teacher, whose name escapes me at the moment. She’s the young lady kneeling right in front of me. 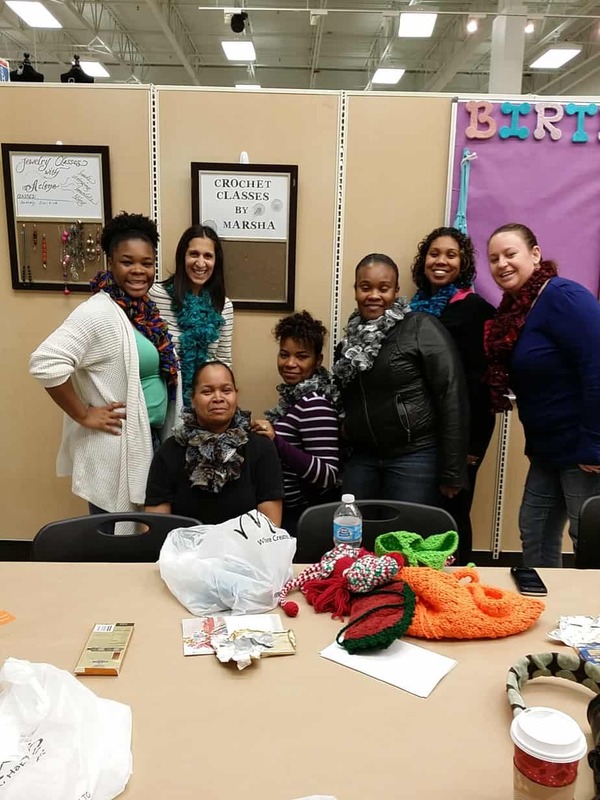 None of us knew how to crochet when we walked through the door, but we all walked out with finished scarves AND it was a totally impromptu class. She had the patience of a saint as well. Like all people with crafters ADHD, I went ahead and purchased more of the ruffle yarn and completed exactly two more scarves, and left it at that. This one went to Mor-Mor (my mom for all of you new readers) and I think that she likes it well enough. 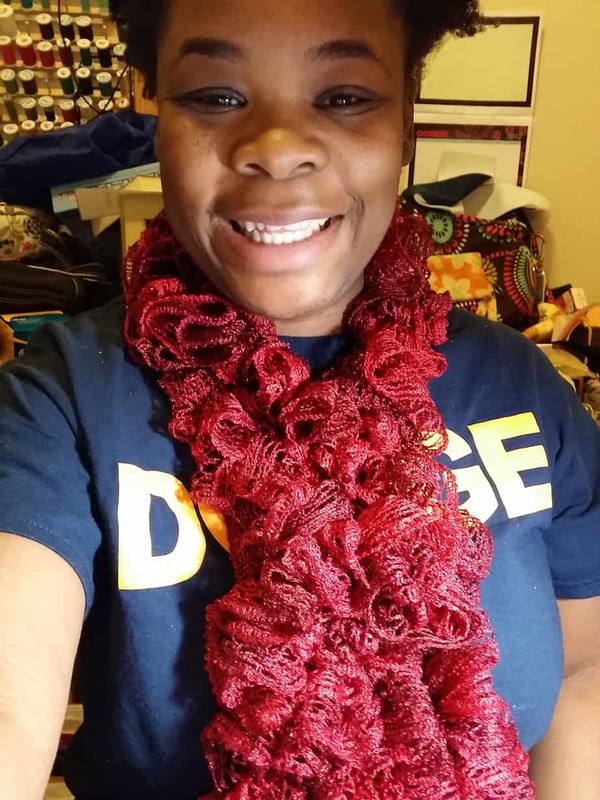 After completing these scarves, I wanted to see if I could move to doing a hat. I’ll show you the progression, and then the final product. I literally took the starts apart over seven times, and the last time I ONLY finished because Mr. Houseful said he just wanted me to finish it and wear it and be proud. Stitching in the round is really interesting. 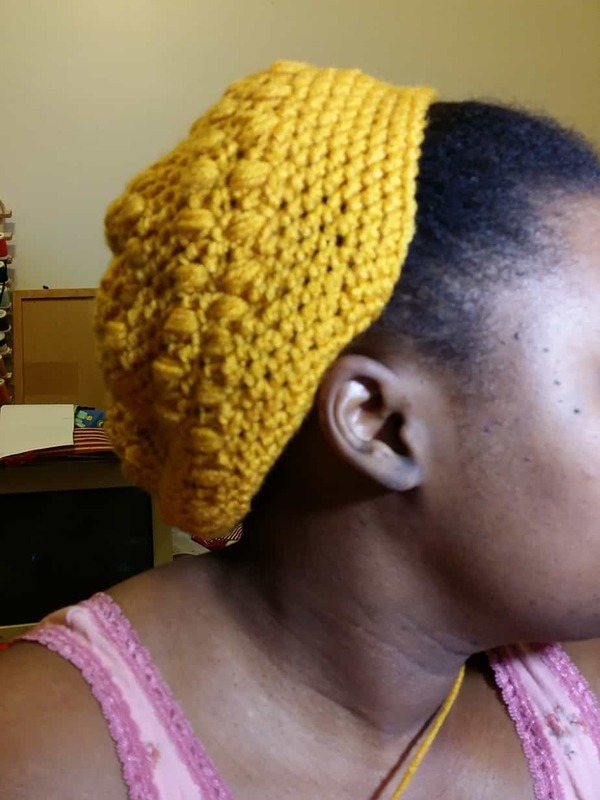 Increasing stitches and double crochets and what not. 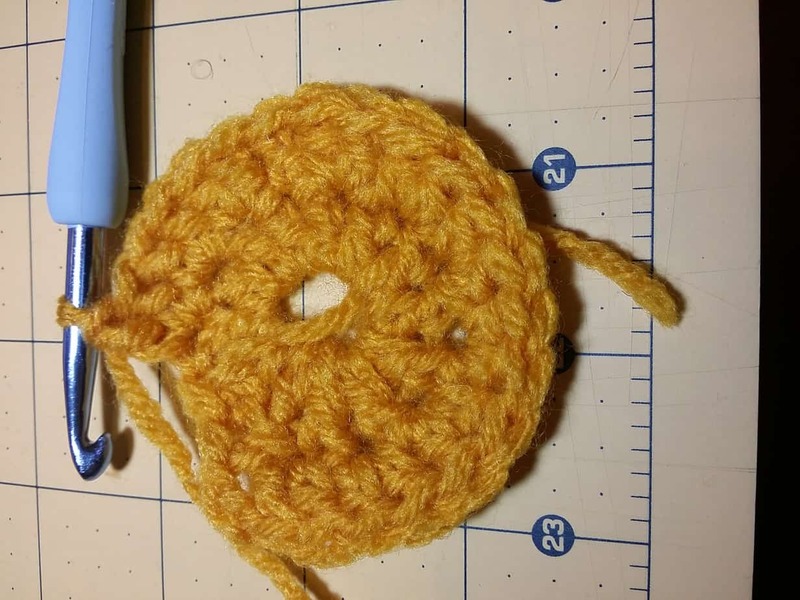 I’m still not well versed in crochet talk, but I used video tutorials from bobwilson123 on YouTube and got quite far. Then this happened. It started bunching up when it shouldn’t have, but then I found out that it possibly should have been doing this, and I had already taken it apart. Ah, you live and you learn. So I started again. I got a flatter round this time, and it seems that I increased way too many times here. It stayed flat for WAY too long. 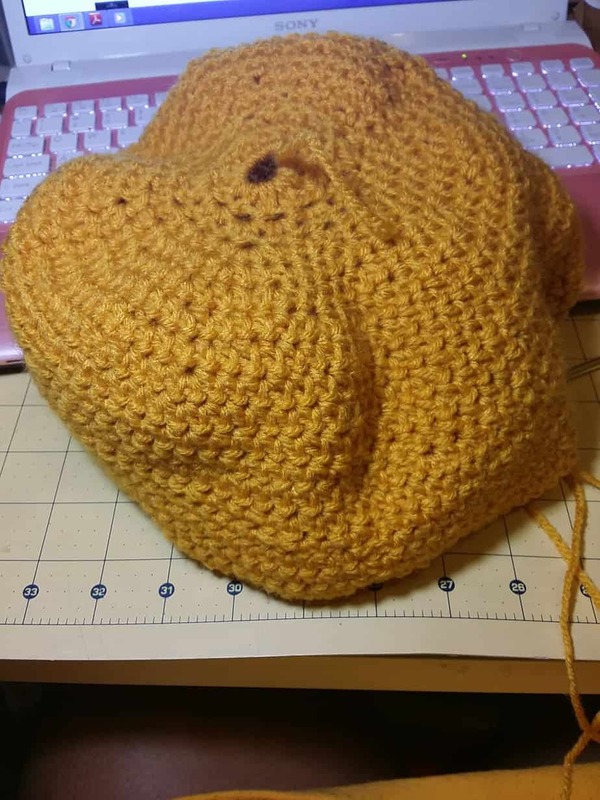 Now, here is the hat taking a bit of a curve shape. 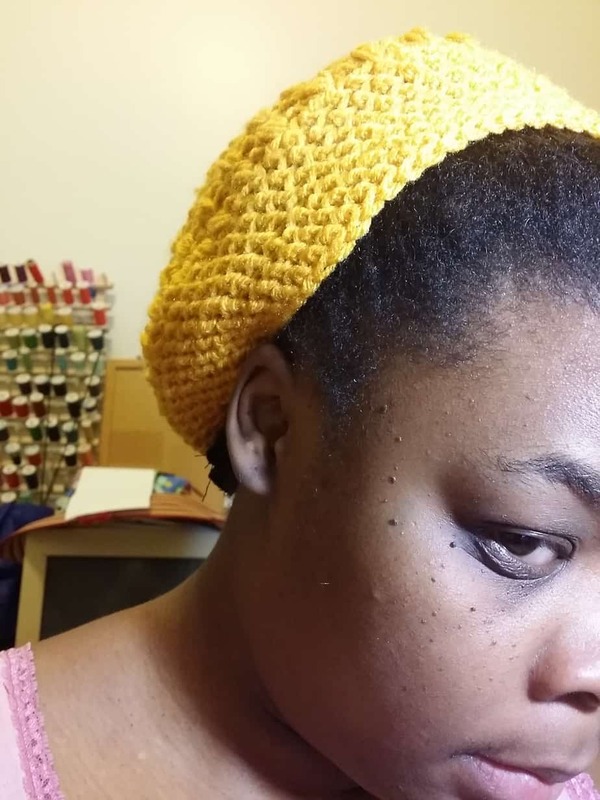 I wish that you all could have seen the look on my face as I realized that my head would literally have to grow quite a bit in order to fit the type of hat that I was crocheting. It got all wonky looking to me. I think that I should have kept going, but once a stubborn person, ALWAYS a stubborn person. 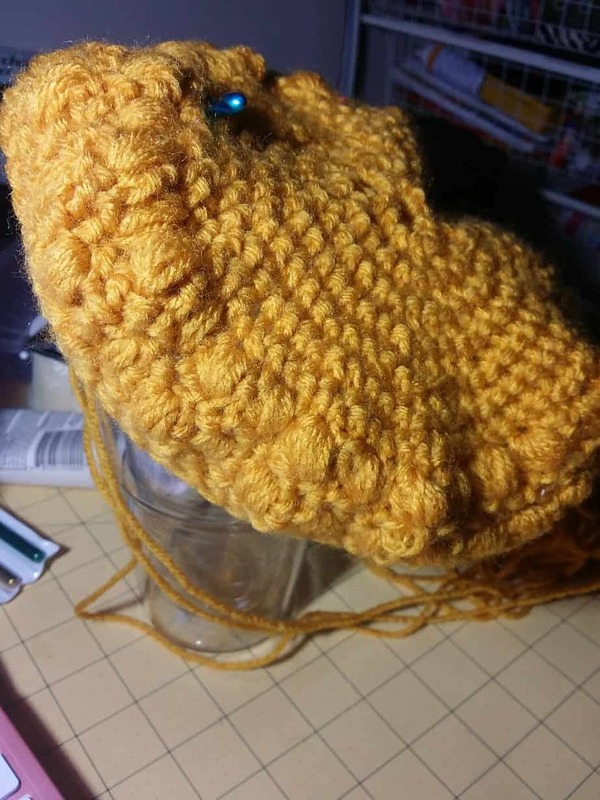 So then, I ripped out all of the stitches, and after unraveling quite a bit of loose yarn (it takes quite a long time if you were wondering) I started with another pattern to the hat. I used a puff stitch in it to break up all of the rows which I think was causing me lots of confusion. I liked it. 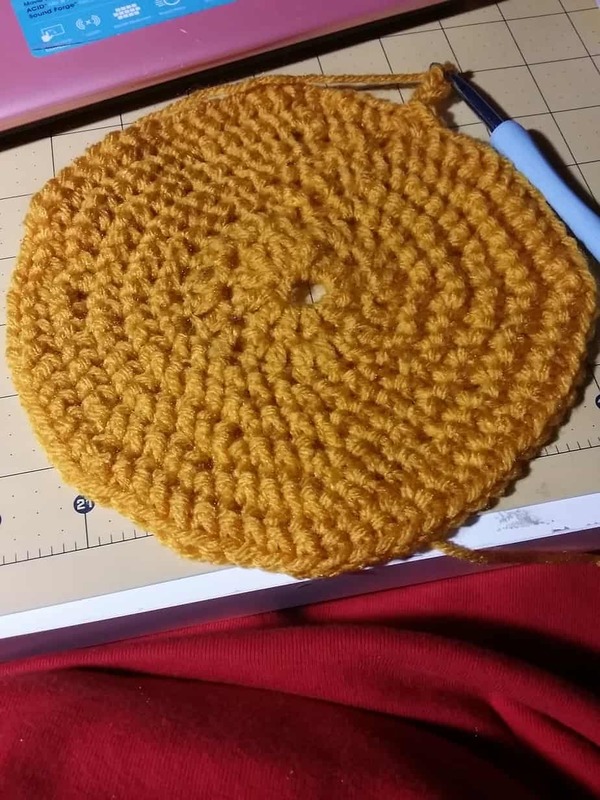 And even though I know that I didn’t increase in between rows like I was supposed to, I made a promise to Mr. Houseful to finish the hat, so I did. And here it is on top of my head, in my very random late night photo shoots. I get all dressy for those times, don’t you see? The random string you see is the last of the yarn that I hadn’t cut off yet to close the last stitch. 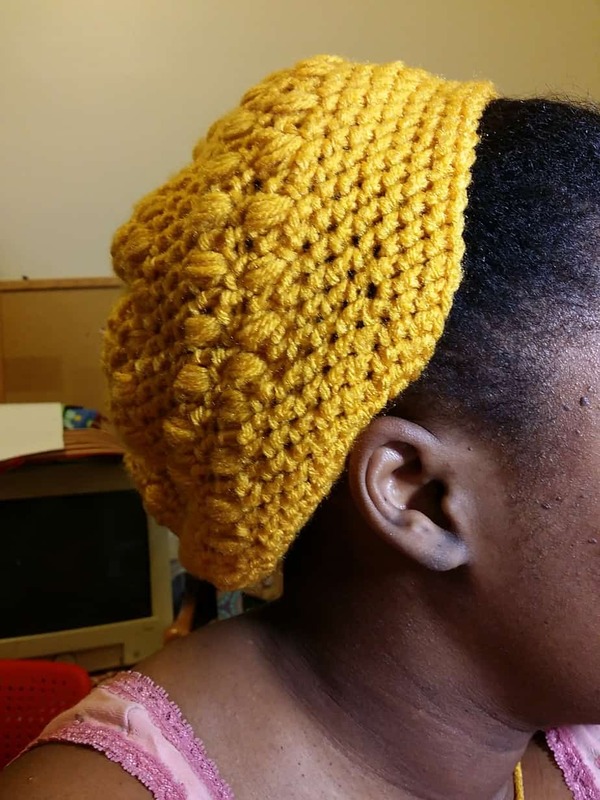 I love the way that it turned out, and I think that I may do another hat or two in different colors. Who knows. I want to try another stitch, but I’m not sure which one to go for. Here is a clearer picture of the hat. 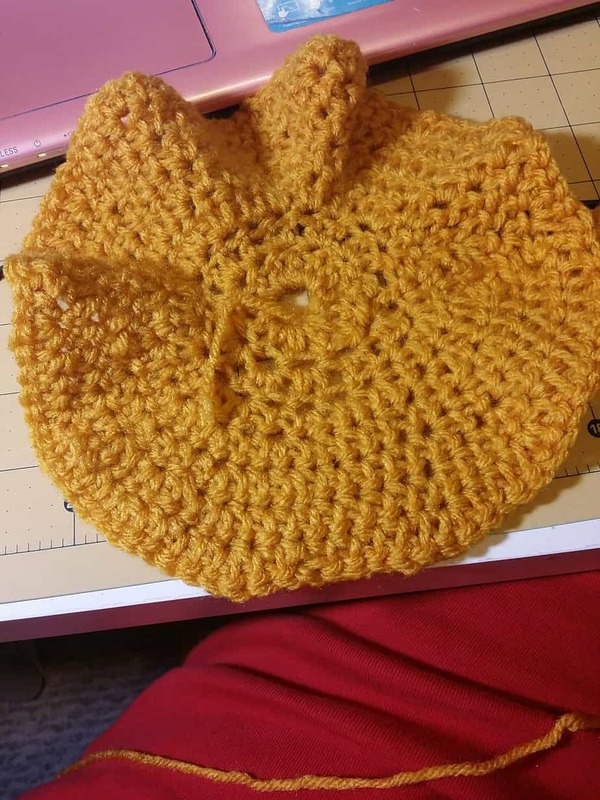 You can tell that the brim is definitely more defined than the rows in between the puff stitches. You live and you learn, but I’m the proud owner of a slouch hat! So, do you crochet? Knit? What projects or quilts have you been working on this week? If you’re doing a process project, share those too! I love coming through and visiting my friends all over the blogosphere! Until next week! Don’t forget to share your linky. You won’t see a photo pop up, because it now costs to do so. So, there’s that. You’d never know all the trouble you had with this hat, the way it came out. It looks fabulous. And I think you should pair it with your new dress. Thank you! I would have to make this another color in order to pair it with that dress. I fear that it would make me look TOO church like though. Ha!